**CERTIFIED** LIMITED 4X4 4RUNNER! 1-OWNER! NON-SMOKER! CLEAN CARFAX WITH NO ACCIDENTS! SUPER CLEAN INSIDE AND OUT! COMPLETELY SERVICED AND READY FOR A NEW OWNER TO ENJOY! TOYOTA's QUALITY WITH 4X4 CAPABILITIES TO GET YOU THROUGH THE TOUGH WEATHER CONDITIONS WHILE DOING IT STYLE! NICELY EQUIPPED WITH HEATED LEATHER SEATS! NAVIGATION! DUAL POWER SEATS! JBL SOUND SYSTEM w/SATELLITE RADIO READY, BLUETOOTH & AUX PORT! POWER SUNROOF! FRONT & REAR SIDE AIRBAGS! TOW PKG! DUAL CLIMATE CONTROLS! RUNNING BOARDS! KEYLESS ENTRY w/AUTO-START! 20" ALLOY WHEELS! POWER SLIDING REAR WINDOW! HOMELINK! SO MUCH MORE! STOP IN TODAY! BUY THE BEST FROM THE BEST! YOUR PREMIER WEST MICHIGAN DEALER! **OUR INVENTORY CHANGES DAILY PLEASE CALL FOR AVAILABILITY** To see more photos, obtain store hours or for additional information visit our website at WWW.SUPERIORCARDEALS.COM or call us toll free 866-826-0389. Trade-Ins are always welcome. We have many financing options available for all credit types. ON THE SPOT FINANCING AVAILABLE WITH GREAT RATES AND LOW MONTHLY PAYMENTS! DRIVE YOUR NEW CAR HOME TODAY! 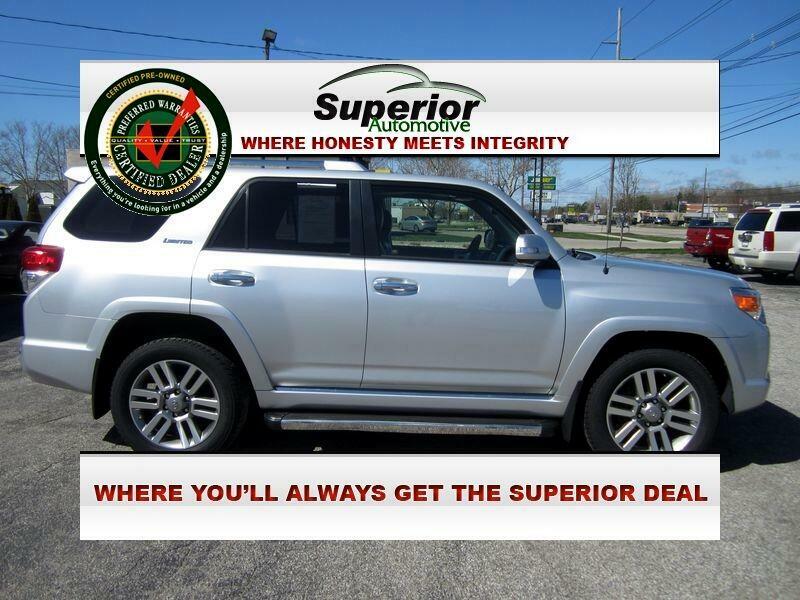 When you buy a quality pre-owned vehicle at Superior Automotive you can buy with confidence knowing that if a vehicle doesn't meet or exceed our expectations we won't sell it. PERIOD! Each and every vehicle at Superior Automotive is detailed and fully reconditioned. Scratches are touched up, dents are removed, carpets and seats are cleaned. Everything is done to bring it back to like new condition. Every vehicle at Superior Automotive then goes through a rigorous 88-point safety inspection and CERTIFICATION process performed by our very own ASE Master Certified Technicians. After passing our inspection, we warranty most our vehicles along with the first year of oil changes FREE. This is our way of showing our appreciation and commitment to our valued customers. We Also Offer Extended Warranties To Meet Your Individual Driving Needs And Give You Peace Of Mind Against Unexpected Future Repairs. Make sure you're getting the SUPERIOR DEAL at SUPERIOR AUTOMOTIVE! WHERE HONESTY MEETS INTEGRITY!